"Cocktails are luxurious, decadent and delicious first. 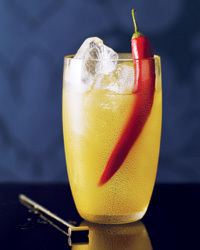 Then they are alcoholic," says Sebastian Reaburn, the author of Complete Cocktails: Stir, Shake & Make. Reaburn serves outstanding cocktails and mocktails at his bar, 1806, in Melbourne, Australia. He attributes his passion for creative flavor combinationslike the turmeric, cumin and sweet paprika in the Pomme Pommeto the bland beverages of his childhood. "I think the most interesting drink I had was a vanilla milk shake."